I didn’t always love my body. From the time I was old enough to realize that I did not have the petite “cookie cutter” body featured in all of the magazines, I felt that I was different and somehow flawed. My self-confidence and self-esteem were definitely lacking until I learned that strong is beautiful. Growing up in the surfing industry, I was told continuously to lose weight in order to model for the brands that would grant me the finances to compete. I wanted to do anything it took to be able to compete and continue my professional surfing career. So I stopped focusing on my love for the sport and more on the size of my body. I was unfulfilled and fighting against a body type that was not made to be small. I realized I had lost my love for my sport, and in essence myself, that I knew things had to change. I made the decision to choose my health and focus on what made me happy, over the size of my bikini. I stopped fighting and began to concentrate on being the strongest and healthiest version of myself so that I could be mentally and physically healthy. I chose to love myself. As a result, my whole life changed the moment I made the choice to take care of myself. Doors began to open where my body was accepted and my athleticism was praised. It opened up a new chapter and ultimately my life purpose. I wanted to share my story and help other women love and accept with the bodies they were born with. I want to remind women that healthy comes in many shapes and sizes. I personally have a pact with my friends that we don’t talk down about our bodies, and when and if we slip, we encourage a “penance” of positive affirmations. Begin to say nice things to yourself. Begin to send love to yourself including your body. Begin to acknowledge what you like about yourself and your body and build from there. This can be done by taping some affirmations on your mirror to help remind you or by using tracking sheets to help catch yourself talking negatively. When you do catch yourself, simply rewrite that statement into a self affirming one. Be loving, be kind, and set an intention to actually create a positive self/body talk practice. Consider yourself an advocate for yourself. I’ve found the act of practicing gratitude can actually elevate your mood and perspective over time. So why not begin practicing gratitude about your body? These gratitudes can be anything from being thankful your body processes food, to things that you find beautiful on yourself. One of my dearest friends would never wear clothing that would expose certain areas of her body. Because she believed her body wasn’t beautiful, she avoided pools and beaches, or wearing skirts and shorts, or even going to events. A few years later, she started to challenge this behavior and her comfort level increased every time she would wear clothing she never thought she “could”. So put on that white dress or bathing suit you said you’d never wear until you reach “that” size and tell yourself, “YOU ARE BEAUTIFUL”! Fill your social media up with sites and celebrities who celebrate the beauty of diversity! When we start seeing different shapes, abilities, and colors, we begin to break down the brainwashed images that there is only one stereotype that represents beautiful. Give feedback and appreciation to sites and companies that are showing their growing diversity and exposure for all women of all sizes. I believe that getting active without any pressure to change your body and instead working out to build strength, and bolstering health, can completely change the whole game. Not only is this good practice for your body from a physical health perspective, it’s good practice for your soul. Choose to get active to be the strongest version of just you and no one else. Dedicate each workout to loving your body, not shaming it. Over time, you will begin to feel strong, capable and gain confidence from within. This summer try something new! 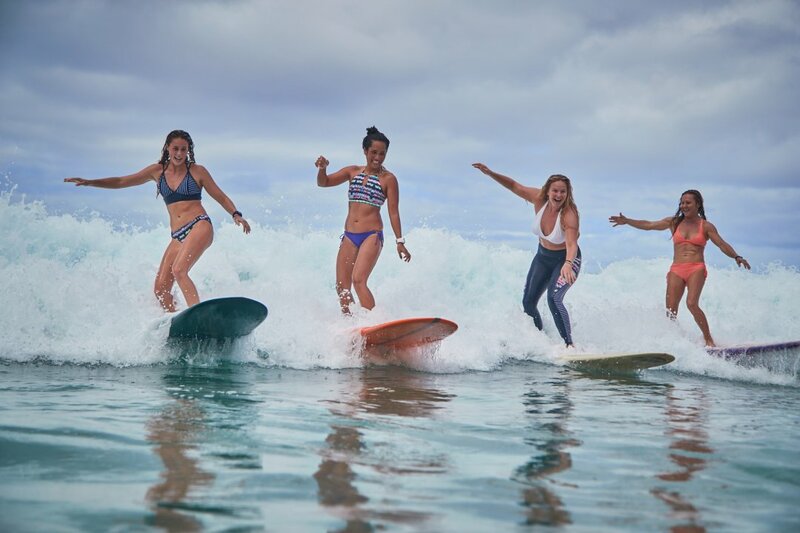 Have you always wanted to go surfing, try that yoga class, or hike that mountain?! Do it. Don’t wait until you reach a certain image or size. Do it now and show yourself you are capable, strong and worthy exactly as you are. And most importantly, grab your best girlfriend and have her join you! We are truly stronger together!